It probably comes as no surprise that The Great Library and I have had our ups and downs, given the precarious changes involved when a planned trilogy gets expanded to five books. Admittedly, my enthusiasm for the series took a hit after things slowed down in Ash and Quill, when much of the plot felt like mostly filler. As the fourth book in the series though, Smoke and Iron gave me high hopes that things will pick up again, now that we’re past the “middle doldrums”, so to speak. Again, the story picks up immediately from the end of the previous novel, so if you’re not caught up with the series yet, be aware that this review may contain spoilers ahead for the first three books. Hoping to save his friends, Jess Brightwell has assumed the identity of his twin brother in a desperate gambit to gain access to the heart of Alexandria and get close to the Archivist. Along with the girl he is in love with, Morgan, and his mentor, Christopher Wolfe, Jess is captured and imprisoned, but their other friends including Khalila, Dario, and Thomas are aboard a ship trying to figure their way out of their own troubles. Now the Feast of Great Burning is at hand, and tensions in the city are at a boiling point as rebels position themselves to fight back against the Archivist’s rule. With thousands of years’ worth of knowledge on the line, Jess’ plan is threatening to unravel as his enemy’s forces are on high alert for any signs of trouble. Meanwhile, his friends have become embroiled in a situation with the King of Spain while grappling with their own challenges on their seaborne adventures, and Morgan, attempting an escape from the Iron Tower for the umpteenth time, has found someone she thinks might be able to help. Unfortunately though, there’s no telling whether or not he will cooperate, or even agree to hear her out. 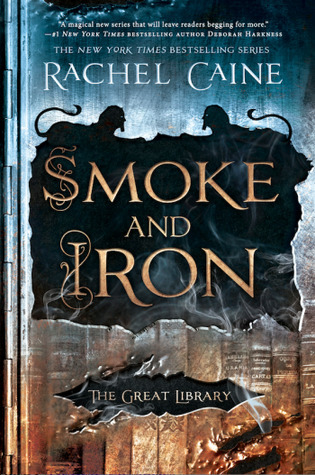 In many ways, Smoke and Iron feels like the book that sets this series back on track. Although we’re still not quite at full steam yet, great strides have been made to build interest in the story again, setting the tone and raising the stakes. Rachel Caine also made one very important change in this book, bringing in other perspectives other than Jess’s—probably one of the best things to happen to this series. Ever since Paper and Fire, I’ve noticed how being restricted to only one POV has started to hurt story progression, and with the group all split up in this one, the need to see through the other characters’ eyes became absolutely essential. It was also high time that readers got to know characters like Khalila, Wolfe, Morgan, and others on a deeper level, as over the course of the series, their roles have become more prominent. That said, there are still a few hiccups to be ironed out. Like many penultimate volumes, Smoke and Iron has the feel of a bridge book where characters are binding their time, with a lot of shuffling about as they are maneuvered into their final places in anticipation of the conclusion. Things were slow to take off in the first half, but to the author’s credit, the story’s atmosphere was handled deftly with the tensions never easing. She also made up for a slower start by packing the second half with tons of action, intrigue, and a good dose of heartbreak. Say what you will about these books, but no matter how shakily they start, each one always ends on a great note, making me excited for the next one. Smoke and Iron, as it turned out, was no exception. Caine is really teasing one hell of a finale with this one, ratcheting up the pressure on our characters, while still introducing more conflict. Morgan’s powers are growing increasingly more disturbing, which doesn’t bode well at all for a future between her and Jess. It also looks as if the Brightwells, already no strangers to pain, will have another tragedy on their hands. Even this late in the game, the world of The Great Library still holds plenty of surprises so it wouldn’t do to underestimate this series. With only one more book on the horizon, I’m bracing myself for big things. Oh damnn 3.5 and what do you think of the series as a whole until now? :O The covers are so pretty though but I totally get your issues with it hahah ! Wow, this is on book four already! And sounds like it’s setting up a big finale pretty well. Glad it was good, and that the additional POV’s added to the narrative in a good way! Yeah, it’s hard to say. I would probably wait until the last book comes out and read the reviews to decide. The first book was a 5 star read for me, it was just that good. But none of the sequels have come close. I’ve always been in two minds about trying this series and I’m still not sure if it would be my kind of thing! The first book was magnificent. But yeah, I’m having a hard time deciding if I should recommend this series right now, just because things have slowed down since. I’m hoping the final book will be spectacular so I won’t have to feel conflicted anymore! Sadly, I gave up on this series after I missed the release date for book 2 and just never went back to read it. Sad because I LOVED the first book! You should try! Book 1 was incredible. I was actually quite happy with book two, and my own disappointment with the series didn’t hit until book 3 😀 Yeah, I’m hopeful that the finale will be worth it too! Ack the great library series!!! On another note, I managed to forget my wp pssw again! Yeah, the good news is that the author must have a lot of great ideas planned, or the series wouldn’t be extended otherwise. The bad news is the hell it wreaks on the pacing of the rest of the books, especially if the decision to change happened in the middle of the series as was the case here. The last two books were definitely affected! This is a series that I was desperate to read but just didn’t find time to pick up – even though I do have the first (maybe even the second book). I recall that you were less happy with the last book and that did put me off a little, interesting that this is now picking up a little – to be honest, I’m always a bit wary when books suddenly go from 3 to 5 in a series, it just makes it feel like a lot of filler will be going into them to expand the content – I know that probably sounds a bit cynical – but, I think I’d sooner have 3 books that deliver more of a punch. Still, I’m really interested to see how this concludes – whether on a high or not. Fingers crossed for a great ending. Yeah, I wonder if the decision was based on the fact that these are technically YA books and the reason they couldn’t just go with three huge tomes is because there’s a page length they were aiming for, so the series was instead lengthened from a trilogy to five books. I think I told you I finally got the first book in this series. I’m excited to read it but a little nervous at the sound of the series being expanded that way. Hopefully it will have an awesome ending with the next one.